Today is the birthday of Evelyn Silverstone, a.k.a Evelyn Kaye a.k.a Evelyn Kaye Klein (1911-1990). A Julliard trained violinist she was discovered by bandleader Phil Spitalny, who made him the star of his All-Girl Orchestra, called the Hour of Charm Orchestra when it was featured on the Hour of Charm radio program (1934-1948). In addition to the radio shows, the orchestra toured and performed live in presentation houses and similar venues. They were also featured in the films When Johnny Comes Marching Home (1942) and Here Come the Coeds (1945). Spitalny and Kaye married in 1946. 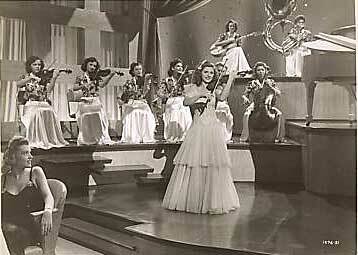 After the show went off the air the orchestra continued to perform as a live act until 1955. 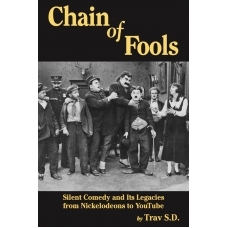 To find out more about the variety arts past and present, consult No Applause, Just Throw Money: The Book That Made Vaudeville Famous, available at Amazon, Barnes and Noble, and wherever nutty books are sold. Next Happy Birthday, Carla Laemmle!